UNIUYO Freshers Resumption will be happening anytime from now, since the striking lecturers will be returning to work. The fact is that UNIUYO Freshers Resumption may be a pleasant experience for some, and a chaotic for others. 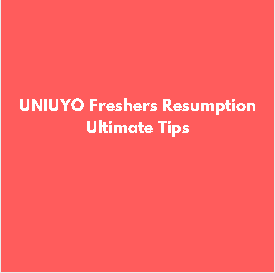 The few tips we have compiled is to help you to have the best out of your UNIUYO Freshers Resumption. Stack yourself with all the essentials you will be needing before departing for the university. Open a student bank account (If you have one already, the better!). Get ready to be more financially conscious. Find information on the university website on your courses, registration procedures and for other details. Ensure once the hostel facilities are opened, you move in immediately. It is only natural that you will make friends swiftly at this initial stage. In the spirit of friendship, ensure you don’t isolate yourself. Get to know your room mates. A short introduction will do. Make sure you are comfortable. Wade off the feeling of home in preparation for serious academic work. It’s easy to get overwhelmed and confounded as a newbie, it is important to seek help whenever you are in doubt or in need of any information. Believe in yourself, and never doubt your abilities. Hard work and courage took you to where you are, and never for once give up those principles. Endeavor to check your faculty or departmental notice board occasionally, there is a wealth of information there, that will guide you. In order to prevent overspending and insolvency, adhere to a strict budgeting scheme. Make the most of your time when not studying – extra skills that you develop, contacts and networks that you may gain at university will enhance your degree, boost your CV and could create new opportunities after graduating.